Why is all the best tasting food so hellishly bad for you? It truly is one of the greatest injustices of the modern world. Forget nonsense like low-carb, cheese-free pizzas and sugar-free ice cream, or whatever other glorious food hipsters have ruined this week, I’m talking burgers, fries, chicken wings, cake… things you crave when you stumble out of Decodance at two in the morning. While oh-so-delicious, these ‘takeaway’ type foods almost always spell bad news for your waistline. 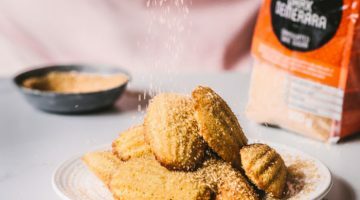 Sure, it’s only a matter of time before scientists pull up their socks and invent calorie-free takeaways, but while we wait for that to happen we can rest easy knowing that some dear hearted souls are doing their bit to help us enjoy the delicious things in life with a little less guilt. 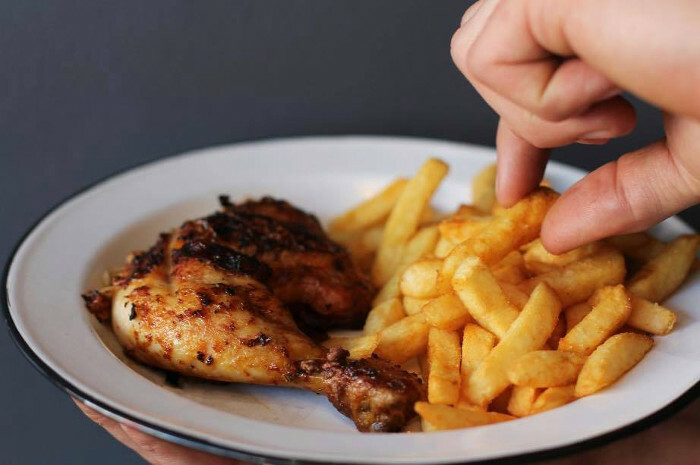 Take Sea Point’s The Chicken Shop for example – started by the team behind popular eatery Jarryds, this new-ish fast-casual eatery is all about offering speedy, efficient and healthy takeaways for those looking to indulge, even if it’s only a little bit. With a focus on doing roast chicken oh-so-right, this spot is sure to become a firm favourite with those looking for something a step and a jump above takeaway spots like Nando’s. 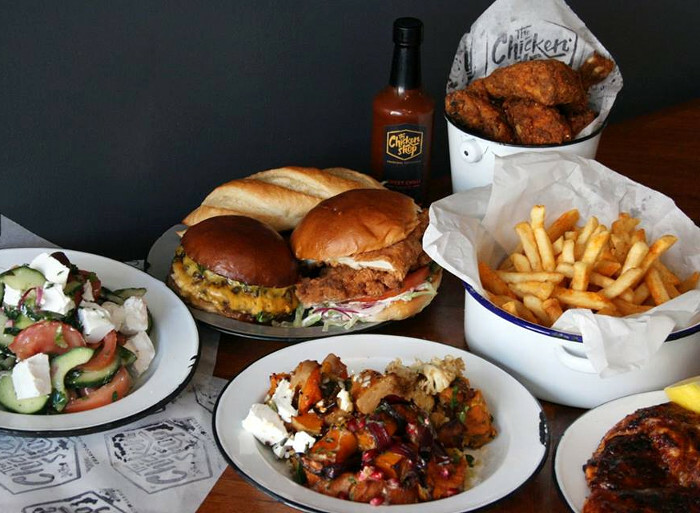 There are loads of ‘healthier’ options for those looking to indulge without the guilt and we love that the chicken used on their menu is free-range, grass-fed, and organic! Perhaps the best thing about The Chicken Shop is how laid back it all is – from the food to the decor, it’s all wonderfully uncomplicated. There are no waiters to take your order, upon arrival you simply head to the counter and choose something delicious from the menu displayed overhead – the Chicken Schnitzel Burger (R66.90) or Slow Roasted Lamb Roll (R90.90) served with salads, Spanish onion, and homemade mayo, are both winners! If you’re there for the roast chicken, then you can start at one end of the counter and choose between rotisserie or spatchcock in a variety of portion sizes and marinades including Peri-Peri, BBQ, Lemon + Herb, and Thai. 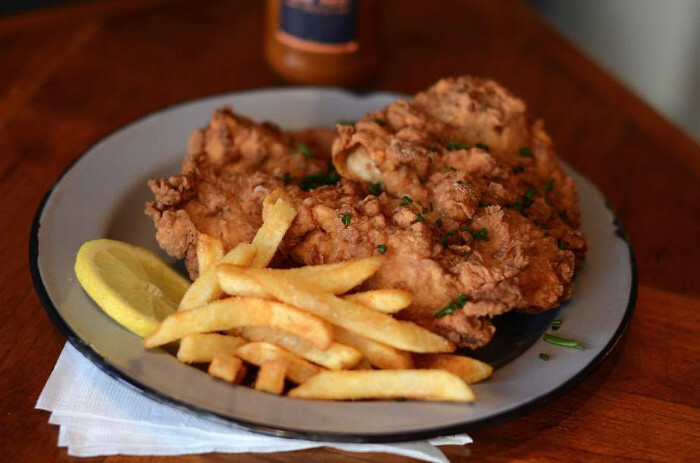 They also have Buttermilk Fried Chicken on offer for those who live life to the fullest. Once you’ve selected your chicken portion, you can move along the counter towards the pay-point opting for various freshly made sides as you go. Choose from delights like fries, lentil-and-chickpea salad, mielies, toasty butternut, sweet potato, mac-and-cheese, and cauliflower and cheese sauce. I decided it was a ‘ride or die’ kind of night so the boyfriend and I went for the half chicken meal (half chicken with 2 regular sides – R125.90) and opted for the Buttermilk Fried Chicken with a side of fries and mac and cheese. Being accustomed to the teeny tiny portions from lesser chicken takeaway spots we were worried the half chicken would be too little for us, but the portion size was, in fact, huge and the sides were super generous. In the end, there was so much food we couldn’t finish it. If you’re a big fan of fried chicken, then I would highly recommend you try the Buttermilk Fried Chicken. A slightly more gourmet take on the grease-soaked favourite, this fried chicken is the things dreams are made of. Our chicken dish was juicy and melt-in-your-mouth delicious and the Buttermilk flavoured crumbed skin is packed with flavour and not overly greasy. 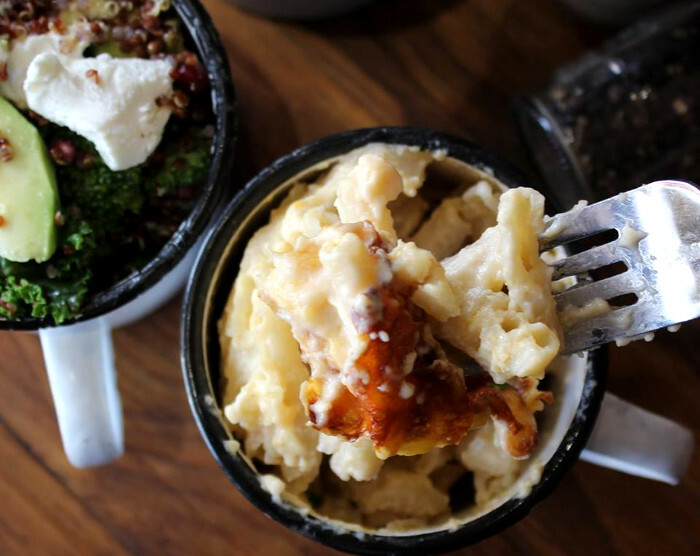 Even the sides at this joint can be classified as a main attraction – the golden delicious fries are just the right amount of crispy and soft and the mac-and-cheese is comfort food at its very best – cheesy, creamy, and decadent, it’s a must try! Find The Chicken Shop at 162 Main Road, Sea Point, Cape Town for more information and for the full menu visit their website here. Previous post 5 Affordable River-Side Holiday Spots in SA!